I have decided to do a guest article in a certain friendly magazine, and I wanted to show you a peek of what I have been working on. Usually, in the world of fashion, no one will remember a show if it had no impact. Most of the designers have become far too subtle, forgetting that when you want to make an iconic collection, you need to do it with a bang. There were only a few ones this year in the Spring/Summer 2011 which were even close. One of those few designers who had made an impression on his viewers every time was Alexander McQueen. Yet after his suicide in February 2010, there was an uncertain moment for the brand. Everyone was curious in which direction the brand would go and if it would actually exist at all. Sarah Burton, the new head designer, surprised everyone by fuelling the spring collection with feminine details, elaborate embroidery and unexpected materials. She had been working with Alexander McQueen for fourteen years and her first show was an incredible success. It crossed the boundary that stopped women from really relating to McQueen and led the brand forward. The show was shocking in a different way to what had been seen before. There was no theatrical show, which everyone was used to at McQueen. 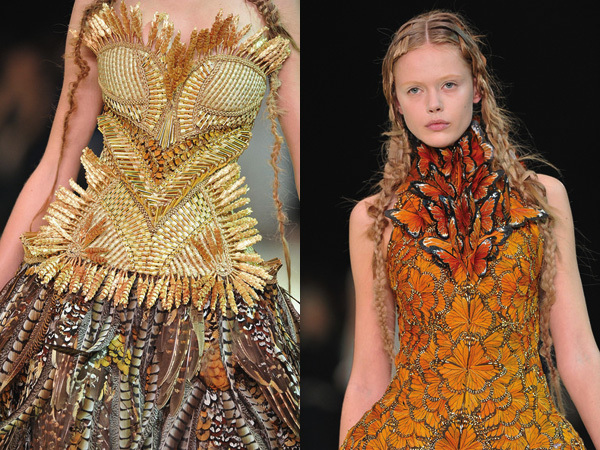 Instead, there were densely patterned dresses and gowns, covered with butterfly wings and feathers. There were suits embroidered with shining buttons, the patterns forming galaxies on the clothes. There were shoes with heels of plastic leaves, demonstrating just how original the designer can make a simple object through an innovative idea. There was a big difference too in the finishing of the clothes- the hems were rough and frayed. McQueen had previously only made designs with defined edges- in this collection though; there were dresses where the shape was only defined by the contours of leather leaves, barely covering the fragile bodies of the women. Where tailoring would expect a hard edge, such as on suits and tuxedos, Sarah had also abandoned the finishing touch, leaving them more natural to the eye without sacrificing their excellent design. She focused on creating outfits which were purely feminine and delicate, even though the shapes might not have seemed so. The combination of hair woven into delicate thin plaits and the fraying edges of the clothes showed that not all outfits have to be strong and defined. The elfish models brought lightness to the heavily ornamented dresses. This way, the outfits were not weighed down with heavy looking make-up or hairstyles. The looks could still be perfect, no matter if the edges were not finished and the models seemed to be wearing no make-up. In the end, this was the perfect canvas for such a detailed collection. Nature and its adjective played a huge part here. It was surprising to see that the usually grotesque figures which modelled the clothes were replaced by ethereal beauties, with unblemished skin and long flowing hair. Their make-up did not collide with the clothes; it was fresh and young, while the clothes revealed a mature woman, who knows how she can show her beauty. With using these contrasts- the young and the mature, the looks were levelled out and for some- perfect. The only remotely darker and more gothic part of the collection was polished and flowing, without disturbing the beauty of the whole. The black suits were perfectly tailored and there were both smooth ones and ones with intricate designs. As nature was an inspiration, the beading and sequins formed vines and leaves all over the fabric. The fuss-free make-up and hair scraped on both sides into thin plaits allowed the clothes to take over the whole look, focusing the attention of the viewer right there. For these pieces, male clothing was an inspiration, yet it was equalled out in feminine patterns which enveloped the suit. Here again, we see the combination of two contrasts and the way that they were mixed to create the perfect designs. Alexander McQueen had been known in his previous collections to use mirror images of some patterns to make a fabric more interesting and it had become his trademark style. How could the House of McQueen be without it for even one collection? Even here, the flowers and stripes on the dresses were split up like the image in a kaleidoscope. Even the dresses where butterfly wings formed the pattern, the geometrical angles of the looking glass were still there. Giving a striped background to the harvest pattern of the medieval mini-dresses was a way to freshen up the style. If Sarah Burton would have stayed with a smooth, one colour background, the dresses would not be as intriguing as they were. The light and flowing outfits were weighed down by wide leather belts with heavy golden buckles and boots, giving it a more medieval warfare theme. They reminded me of the heroines of computer games, whose outfits were very feminine, yet also appropriate for warfare. These females were usually elves, and their powers were given to them by nature. This natural power has been harnessed in the collection of Spring/Summer 2011. The models were looked regal in the dresses. If the dress was not long, the pattern on the dress and its elaborate cut made up for the length and still remained majestic. The gilded dress, in my opinion, was the best piece out of the whole collection. The way that only the embroidered pattern was what created the dress, with the medieval style bodice just used to keep its shape was marvellous. This was how true simplicity could be used to all its glory. The dress was balanced and light, yet at the same time gave a lot of movement in the skirt. This is not just a dress which is meant to make the wearer look more beautiful. This dress finds the beauty that can be is in every woman and brings it out to the surface. The shoes reached up to the ankle and were very original- their heel was like one long droplet of water. Although the heel was so thin, the shoe was still weighed out and proportional. The interesting detail is the gold hobnail at the front. Hobnails were put on shoes to increase their durability, so this must just be a way to make them more elegant and versatile. They complete the outfit perfectly and are also just one of the ‘tough’ accessories used. There were a couple of different designs on the shoes- one of white snakeskin, one with a repeated white flower pattern on black, and two others- black snakeskin and black leather. Gaia, the ancient goddess of nature and fertility played her part in the show too. There were outfits made of wheat stalks and straw, woven together to make the geometric shapes of dresses and bodices. For others, it could be Demeter, the roman goddess of the harvest, who had come to lend the materials for this collection. The dresses and suits were cut around the midriff and sown back together with a thin piece of mesh in between. This allows for hip movement, which is one of the main attributes of a woman’s body. No model would have been able to move as freely in the outfits if it there was no cut. The clothes that Burton creates keep the natural form of the woman’s body in mind, not even forgetting about little details like this. Was Sarah inspired by Mary the Queen of Scots? Her patterned dresses have a high collar that the queen would have worn during her reign. The sixteenth-century monarch seems to have a big influence on McQueen too, who used the high collars in the last of his collections. The thick brocaded fabric which was used for some of the outfits (such as the flower patterned dresses) was also worn during the medieval times. Curiously, during this time, the church had incredible power over people’s beliefs. There was a fascination with anything which wasn’t human and ‘faeries’ were seen as the work of the devil. They are the exact image of a woman Sarah Burton has shown in the collection. In fact, after the middle ages, fairies were only mythical creatures which formed in the imagination of women, who wanted to feel different in their greying lives. 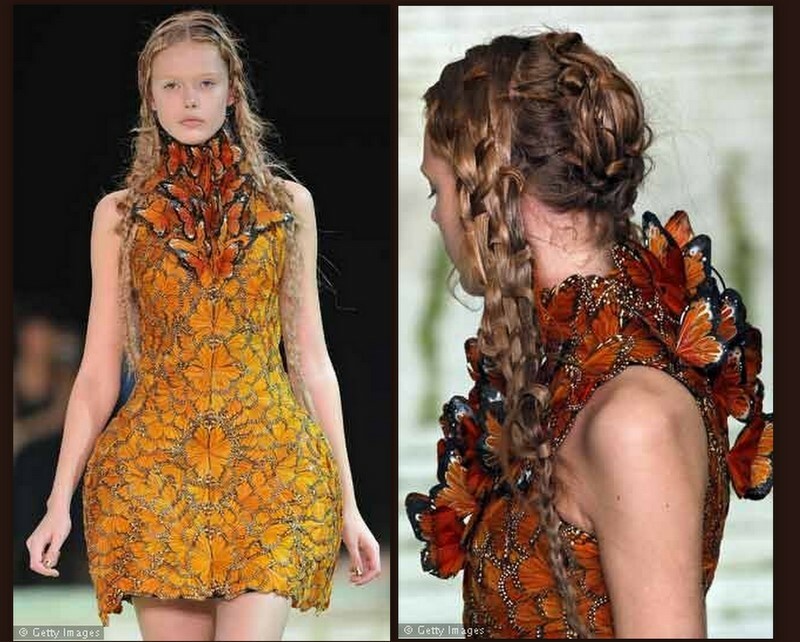 For the modern woman though, watching the Alexander McQueen show, the women/fairies must have been sensational, showing just how close magical creatures can be. The colours included in this collection were startling, to say the least. With typical shades that are used in the spring summer collections such as pastel or neon thrown out of the window, the House of McQueen has once again stood out in the group, keeping only fresh white to relate to for Spring. The other colours would have been appropriate for the autumn fashions, yet they were used here, and to a surprisingly good effect. 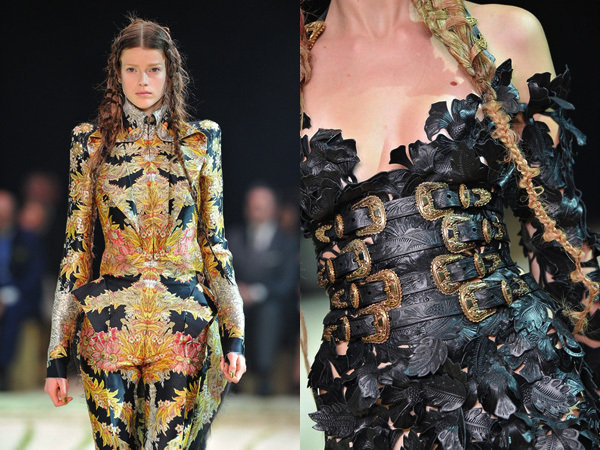 Sarah Burton included brocade in rich hues such as amber, red, yellow, gold, dove grey, olive green and beige. As pheasant plumage was used, the shades there had to link in some way to the ones on the designs. She shows that high fashion does not need to relate to anything going on outside, but can just be brilliant and admired through the ideas. The designer’s main focus was on craftsmanship, which she showed brilliantly in her show. The intricate work she put into the feather dresses, where the feathers folded over so densely, it did actually look like a bird’s wing. The same was for the leather leaf outfits, which seemed like a shroud of the woman’s body, barely covering it, giving it enough exposure to intrigue. A lot of the body was shown, the skirt was quite short and the dress itself was off the shoulders, yet it remained tasteful, which was hard to come by before in McQueen’s show. The same pattern was used for the shoes, where the model’s feet were encased in black leather and buckled up tight. The shoes with their rigid structure showed that women do not need to always have dainty heels to flaunt their beauty. Sarah Burton revealed a woman’s secret- her clothes do not need to expose the body for them to be recognised. It would have been easy to call this collection boring and it must have been hard to get that golden balance- right between shocking the audience, which was the late designer’s tactic, and boring it with shows where one piece was exactly the same as the other. Yet Burton managed, and created a very deep collection for something that must have been done in some sort of a rush. This alone should be admired, but Sarah did even better- she showed a very deep meaning to the collection and turned eyes to an issue which had been forgotten. What was interesting in the outfits was the use of hair and feathers and butterfly wings. Ever since the ecology craze, designers started becoming more and more lenient towards using synthetic fabrics and straying from any sort of natural materials, in fear that they would be accused of exploiting the planet. As many designers became more and more attached to creating modern, futuristic, safe clothes, Sarah decided to reinvent the best fabrics and textures seen in nature, sticking to plastic only for the shoes. Her butterfly dress with the wonderful high collar made of butterfly wings stood out because the colours were not washed out or created synthetically. They were vibrant and beautiful and caught my breath when I first saw them. The woman that Burton created in her collection is in complete harmony with herself- she accepts that she is both fragile and strong, that she can wear both delicate and tough fabrics, as long as the proportions remain in harmony. This is something wonderful that brought the collection out to me as at the moment, in most shows, the designers are fixed on swaying towards extremes. A couple of the outfits were focused around, hair, furs, gold and olive green. These royal shades are used in the brocade of some of the thicker jackets with big sleeves and yet the look does not seem to be heavy. The whole collection is in some way focused on light- the light reflected from the golden threads, the one showing through gauzy fabric and the light in the white colour of some of the dresses. A lot of the collections involved movement and how it is shown, so even tight or rigid outfits had something to them that made them more natural. The golden green suits had hair, the dove grey bodice had a skirt made of ostrich feathers, and the heavily patterned mini dresses had ruffles on the skirts. Relating to collar draping and ruffles which were a trademark of the sixteenth century and the French revolution, Sarah had woven the issue of freedom in the women’s collection. As McQueen was very focused on liberating women from stereotypes, this historical connection must have been one of the many metaphors of doing so. The pleating that was on the collars was also repeated around the skirts, which made the dresses seem less uptight and gave them a flow, which had not been seen previously. By accentuating the silhouette and making it more like the ones seen in the fashions of the Middle Ages, Sarah Burton has revived another trend from that time. The emphasis on the hips and the flat chests were seen as a mark of a high class lady, which the House of McQueen would surely want to show in its present collections. Although crinolines were first introduced in the middle Ages, they were not the type that Sarah Burton used in the collection. The skirts which went out to the sides were more like the XVIII century panniers, which were wide to the sides and flat at the front and back. Could this be a second relation to the French revolution and the freedom women should have? The ones used in the show were more modern, because of the short length of the dresses in which they were used. Where the dress is longer than to the thigh, the rest of the skirt is in frayed strips of fabric, which move with every swaying of the hips. There was a harmony to all the designs. Although there was still a connection to the alien world, it was more fantasy coming from nature than from other planets, like in the collection for last year’s Spring/Summer. A main inspiration for the collection was elves and women and how one represented the other. The outfits in this collection were more regal and were certainly more in the direction of a queen of this world, than of a different star constellation. Although I am not a fan of using feathers in design, in this one show they were truly beautiful, and the way in which they were used was marvellous. The long skirts billowing with layers of soft down created the movement that could not be reproduced by a machine. There are so much laser cutting and sharp edges in most designs that it is a surprise that someone has not gotten cut yet! A woman is not used to wearing clothes which only would suit a robot. She needs flowing fabrics or clothes which accentuate her figure. They are an ornament to her natural beauty and this is what only Burton has managed to do in her very first collection. This alone is admirable; as there are many other designers who still are stuck in a rut of creating the same clothes, no matter what season. The house of Alexander McQueen has stayed afloat and not let routine take over the collections. The feathers which were included on so many of the designs symbolise the woman’s fragility. They are both to show her main weapon, an element of her beauty, and her biggest weakness, where one hit can shatter her like glass. If anyone was to imagine a woman, the best way would be to see her as a female swan, which is both delicate and courageous, just as a woman should be. Feathers were a main inspiration to another part of art recently- to film. The thriller ‘Black Swan’ is about a ballerina with a split personality, who takes part in the production of Swan Lake (starring Natalie Portman) and was probably the best film of 2010. The costumes were made by the sisters of Rodarte and were covered in feathers, which Sarah Burton must have referred to in this spring collection. Although the jackets and tuxedos were perfectly tailored, the signature pointed shoulder pads from the previous shows were slashed at the seams, giving more movement in the structured outfits. These pointed shoulders were a signature mark of McQueen’s and they were not forgotten here either, making them the perfect finish to the jackets. 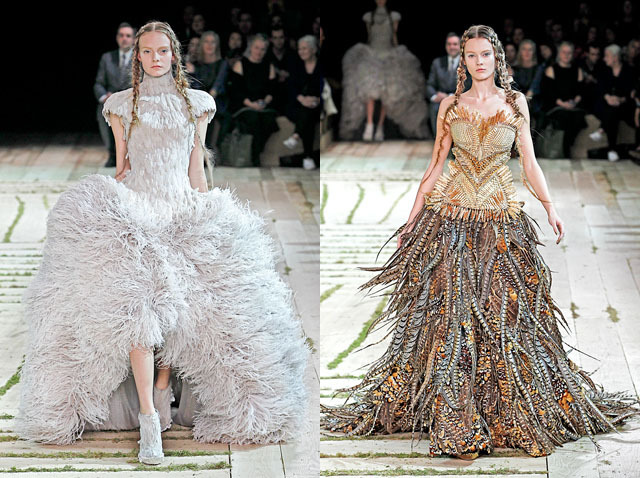 This is just another way that Sarah Burton has updated the House of McQueen’s and it might just be the next big thing. The boring blazers which are so fashionable right now should get an update, and this is definitely one of the ways to do it. Who knows, this could be what such classics like blazers need. With the ‘modern woman’, who has rights, is allowed to drink, smoke and have multiple partners, most designers have not paid any attention to the fact that she is still weak inside. This fake confidence only confuses women and they rebel, not exactly knowing against what. In this collection, it is shown that even the ‘modern woman’ can accept herself for who she truly is and remain strong. She does not have to pretend or lie about how she feels and that is shown through these clothes. If other designers would go in her steps, they would see that their own synthetic collections are as boring and common as plastic. Theses futuristic designers create a robot, one which is free to do anything, to have manly jobs and tasks, without actually examining who a woman is inside. I would not be able to feel like a woman if I chose minimalism in its cruellest form, with boxy jackets, unnatural colours or ugly shoes. is essentially a box made of material, which can be zippered shut.